Remote controls. We use them nearly every day – they’ve become an integral part in everyone’s lazy lifestyle. Why bother moving if you can stay still and push buttons! Computer remotes are starting to emerge as the new “hit thing” (much like LCD’s). The most popular of these remotes and by far the easiest to configure is the home-brew serial receiver which you build yourself using a schematic off the internet. But what about people who have don’t have the time, knowledge or skill required to build these? This is where Ricetek has stepped in – providing this and a few other hand made mods that allow you to enjoy the benefits of a “Do It Yourself” job, without the associated hassles. 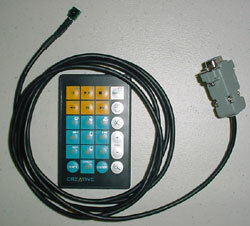 Ricetek have chosen to provide a Creative remote with this receiver. This creates a solution for what can be one of the biggest problems with making your own adapter – getting a remote. The Creative remote started out live as an add-on to some CD-ROM drives they released, notably the Infra52x. Because of software issues with the remote, they never really took off. Ricetek have sourced a large stock of these remotes, and bundled them with this receiver. The remote is a good one for this package – it’s the same size as a credit card, and 5mm deep (4 CD's stacked for the lazy ones – this is a remote control review remember ;) ). It’s a solid feeling remote, with 24 raised buttons. The buttons have a nice feel to them, and feel as if they will stand up to a fair bit of use. 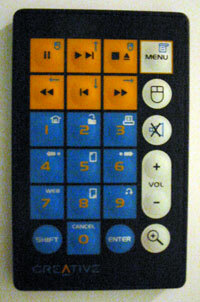 The remote is powered by a single CR2025 3 Volt battery, which is supplied. It’s nice to see that the battery supplied is an Energizer, and not some el-genero brand, which means that it will most likely last for quite a while. Software setup is very simple. The software that you use to interface to an Infra-Red receiver is WinLIRC, which is very easy to set up. A pre-configured file is supplied for the remote, so you do not have to manually learn it (that is – configure the software to recognise the remote control) yourself. There are 2 main pieces of software needed to drive a infra-red receiver – a program that translates the remotes signals into a command, and a program that runs a macro (a defined string of commands, for example “Next Track” in WinAMP) based on that command. These two programs are WinLIRC (for translating the signals into a command) and IRAssistant (for running the macro’s based on the commands from WinLIRC). WinLIRC is very easy to set up. A pre-configured file is supplied for the remote, so you do not have to manually learn it (that is – configure the software to recognise the remote control) yourself. WinLIRC can be downloaded here, while IRAssistant can be downloaded from here. IRAssistant is a little difficult to set up. You have to define what you want each button to do, and you can group them so that you can use the back/forward buttons in more than one program. This can be a little bit daunting at first, but a read of the readme explains how to use it easily. The components that make up the receiver are all encased in a single DB9 connection housing, which while being a bit of a cramp for space, makes for a very neat and effective solution. There is one insulated wire leading from the DB9 plug, and that leads to the actual infra-red diode itself. 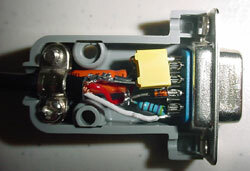 The legs of this diode are covered in heat shrink to prevent shorting out. The infra-red diode also has a small green casing around it, which will give it more durability than the bare diode. The length of the cable is up to you – as each receiver is built to order, you specify the length of cable you would like. I tested the unit on my Colecovision PC, as seen in a previous OCAU article. Testing was done under Windows XP Professional. My initial testing was done from a length of 3 meters, directly facing the receiver. At this distance, every button I pressed from the remote worked perfectly. At an angle of 45 degrees from the same distance, the same result was also achieved. Any greater angle and the remote would not work at all. This is a limitation of the infra-red diode. I also tested the remote at 5 meters – the same results were achieved as with 3 meters – perfect. I found any distance further than that to be unreliable – but in normal circumstances, I imagine it would be rare to ever use it at a greater distance than that. After extensive testing on this infra-red receiver and remote, I’ve found it to work flawlessly. This is an idea solution for anyone who is wanting an easy way to control their WinAMP / Video playing software without touching the keyboard, or for people who are building Home Theatre PC’s, and don’t have the electronic knowledge, or time, to build one themselves. The remote supplied is superb for the purpose, and the two function together perfectly. All the fun of having a remote control, without the hard bits of soldering! The receiver cable and credit-card remote are available from Ricetek for AUD$35.